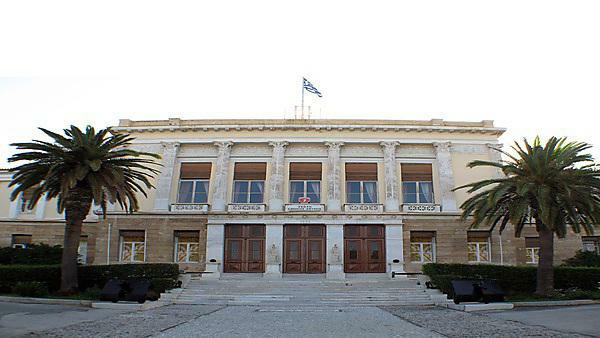 The Hellenic National Defence College in Athens, Greece. Expertise at the University’s Dartmouth Centre for Sea Power and Strategy (DCSS) will be on offer to more students from around the globe next year, with the expansion of an MA programme based in Athens, Greece. The MA in Applied Strategy and International Security, delivered in English at the Hellenic National Defence College (HNDC), is currently available to Greek and Cypriot military officers. It is being opened up to those from other countries, along with civil servants from NATO and its global partners, from September 2018. Diplomats from 16 countries attended a working dinner in Athens to learn about the MA, which is accredited by the University of Plymouth. Organised by the DCSS and the HNDC, the event introduced the programme to ambassadors and defence attachés from countries including the UK, France, Germany, Spain, Italy, India, China, Morocco and Egypt, as well as top representatives from the American University in the Emirates, Dubai. Students on the programme will benefit from two residential courses as part of the MA: one at the NATO Maritime Interdiction Operational Training Centre in Crete, and a second at the Multinational Peace Support Operation’s training centre in Kilkis, Greece. The dinner took place at Athens’ Yacht Club of Greece, and featured presentations from Executive Dean of the University’s Faculty of Business, Professor Nikolaos Tzokas, DCSS Director and MA programme manager Associate Professor Dr Fotios Moustakis, and HNDC Commander Vice Admiral Alexandros Diakopoulos. Further details on the MA in Applied Strategy and International Security are available here: http://blogs.plymouth.ac.uk/dcss/wp-content/uploads/sites/50/2017/11/MA-in-Applied-Strategy-and-International-SecurityFINALVERSION.pdf . DSSG has a policy-focused ethos, with emphasis given to examining contemporary strategic and foreign policy problems, learning from past experiences, and outlining possible policy solutions. The group is a forum for teaching exchange as well as research activity and dissemination.